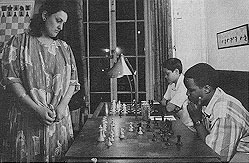 Baraka Shabazz was 15 when this picture was taken in 1982 and strode onto the American chess scene with the grace of a gazelle. Baraka started playing chess while living in Alaska with her parents. It was her father who gave her a chess set to relieve her of the claustrophobia of living in a cabin. Without as much as a lesson on the rules or chess strategies, she began to beat her father, a competitive player, repeatedly. Baraka, which means "blessed," begin gaining notoriety by being the sixth highest-rated female in the nation and went undefeated in the World Under-16 Tournament in England. She also gave simultaneous exhibition of up to 20 boards. I remember meeting Baraka at a tournament in Chicago when her rating was exactly 1942. I remember us sitting around in between rounds and her debating with someone about one of Jeremy Silman's books. She went on to gain an expert's rating, but later grew disinterested, disenchanted and abruptly left the chess scene. The demure pose in the picture above is a testament to her confidence and poise. 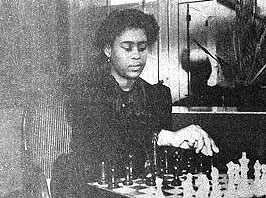 Perhaps Baraka, one of the strongest Black female players in history, will once again grace us with her presence in the hallowed halls of chess. When one utters the name "K.K. Karanja," it has a resounding strength in its essence. Kangugi wa Karanja, translated as "son of Karanga," was born in New York on the 23rd of November 1973 to Kenyan parents and was literally a genius. He attended the Hunter College (in a program for gifted students), excelled in academics (math and physics) and was an All-American in three sports! He earned a 2100 rating by the age of 10, and was pegged as a chess prodigy. For two consecutive years, K.K. Karanja was the highest rated under 13, and won the prestigious Apis award given to those with outstanding academic and chess credentials. Despite being highest under 13 for the next year, he was not awarded the prize. Cries of discrimination were uttered. These allegations were further confirmed when K.K. was to represent the U.S. in the World Under-13 Championships, but was snubbed until calls were made to the USCF on his behalf. GM Lev Alburt lobbied on his behalf and Maurice Ashley offered his services as a coach. K.K. participated in the 1987 U.S. Cadet Championship which is comprised of the strongest players under 16 and scored 2½-4½. After his quick ascent to chess prominence, K.K. improved only 100 ELO points in the next six years to reach National Master in 1989 at 15 years, seven months (youngest Black was NM Howard Daniels, 15 years, 4 months). However, his activity subsided as he gained more interest in his studies and other activities. K.K. has written a chess book and does a lot of chess promotion in Kenya where he has dual citizenship. Hail to NM K.K. Karanja. . . the chess prodigy! KK Karanja - Steven Mayer, New York Open, 1986, ½-½. KK Karanja - Robby Seltzer, U.S. Cadet Ch. (New York), 1987, 1-0.